First, "The Voice" commands and murder is done-but will The Shadow's taunting laugh finally ring out above all? Then, a Spanish playing card, a baggage claim, and a bank check are the enigmatic clues leading The Shadow along the murderous "Alibi Trail." 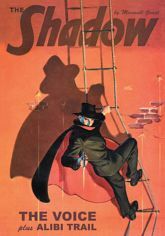 This classic collection showcases the original color pulp covers by George Rozen and Charles Coll, the classic interior illustrations by Edd Cartier and R. F. Schabelitz, and background commentary by pulp historian Will Murray.